Perimenopause is a natural stage in a woman's life. In that stage, most women are suffering from hormonal fluctuations. It can seem frightening, especially when these changes start manifesting themselves as tangible symptoms. However, it's important to remember that there are options available to manage the symptoms of perimenopause. While hormone therapy can be effective, the associated risks can also be daunting. The use of herbal treatments as an alternative is becoming increasingly popular. Herbal Treatments: What Are They? Herbs have been used for centuries for a variety of illnesses. 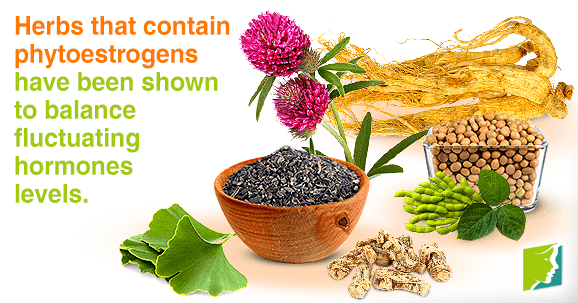 Herbs are considered to be an alternative medicine, rather than an alternative to medicine. Do Phytoestrogenic Herbs Help Perimenopause Symptoms? The increase in the popularity of soy-based products in the West over the past two decades has led to a number of studies and increased interest in the potential benefits of soy. Asian women tend to have less severe menopause symptoms than Western women, leading some to speculate that it's because of their soy-rich diet. However, there is not enough data to draw any kind of statistically significant correlation. Even so, many studies report that women who increase phytoestrogens in their diets have less severe hot flashes than women in control or placebo groups. If you are experiencing severe hot flashes, it may be beneficial for you to look into phytoestrogenic herbs or products containing them. It is important to be aware of any potential side effects or problems with consuming phytoestrogenic herbs. Study results on the benefits of phytoestrogens are often contradictory. This may mean that products such as soy affect each individual woman differently. Perimenopause is a natural stage in a woman's life. Most women experience hormonal fluctuations during this stage. Herbs have been used for centuries for a variety of illnesses, and they are considered to be an alternative medicine for treating hormonal imbalance. Phytoestrogen products are a potential option, as they supplement estrogen levels by introducing plant-based estrogens into the body. Keep reading to learn about natural treatments for perimenopause. Perimenopause is the first stage of the menopause transition, and therefore brings with it a variety of symptoms. Learn more.